Of All the Places in the Wizarding World, Is the Bank What You Most Want to See? I began the discussion of Rowling’s use of tarot card imagery in her Harry Potter novels and post-Hogwarts efforts with posts about her interview and twitter comments through the years about correspondences between the Four Houses, the Four Humors, and the four playing card suits (‘Rowling: Elements, Houses, Card Suits‘). 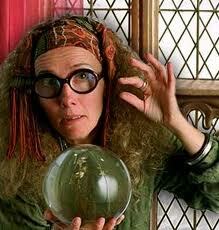 That conversation continued with an exploration of the likelihood that Rowling embedded a comic image of herself, the quirky, all-seeing author with a taste for the occult and divinatory arts, inside Harry’s adventures as Professor Sybill Trelawney (‘Is Sybill Trelawney Really J. K. Rowling? The Case for an Embedded Author‘). Both these posts were inspired by what Eglantine Pillet found in a Rowling biography aside, namely, that The Presence as a Comprehensive School student used to entertain her friends by doing tarot card readings. 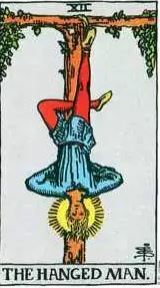 Today I’d like to invite serious readers of the Hogwarts Saga and the Cormoran Strike books to consider one tarot card image in particular, the Major Arcana card called ‘The Hanged Man,’ and its possible importance in understanding Rowling’s work, its artistry and meaning. 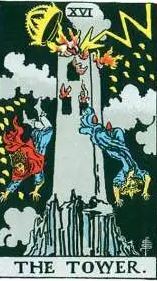 I’m going to do this in three parts: first, a listing of ‘Hanged Man’ appearances in Harry Potter and Cormoran Strike, second, a survey of cartomancer opinions about the meaning of the card in itself and in card spreads, and, third and last, some speculation about how and why Rowling has chosen to make this card such a prominent image in her writing. 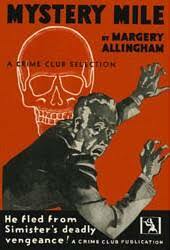 Margery Allingham’s ‘Mystery Mile’: ‘Deathly Hallows’ Embedded Text? 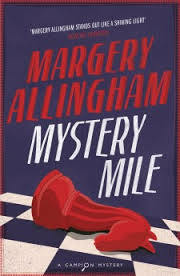 Mystery Mile is a Margery Allingham thriller featuring Albert Campion in his first leading role. If you want the plot, the whole story really, there is a servicable telling of the tale on the book’s Wikipedia page. There is a reason, however, that Rowling has said Allingham was her favorite writer of the so-called Four Queens of Crime — Dorothy Sayers, Agatha Christie, and Ngaio Marsh were the others — and reading her work, as we’ve seen before with The Tiger in the Smoke, as often as not gives you a name or two that Rowling lifts (Johnny Cash! ), a plot point or twist, or something as important as the psychopathology of Lord Voldemort. Without spoiling the story of Mystery Mile, I think I can say now ‘where’ and ‘from whom’ Rowling found a model for her Tales of Beedle the Bard embedded text in Harry Potter and the Deathly Hallows. The Mile story turns on the secret identity of the leader of Simister (that’s not a typo), an international criminal organization, a gangster extraordinaire reputed to be more than one hundred years old. A retired judge learns a clue to the mafioso’s name is hidden in a children’s book but even the best cryptographers of the FBI and of Scotland Yard cannot break the code. Albert Campion, of course, solves the puzzle in the text after a quick look at the Table of Contents. How many stories do you know that feature a kid’s book with an embedded text, the book being embedded in the text as a mirror of our own attempts to figure out who the bad guy is from the clues we’ve been given? Me, too. Just one. 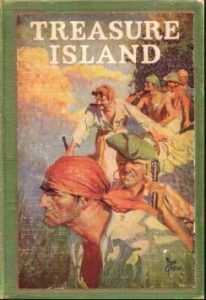 This is early Allingham and not one of my favorites. I hope you’ll give it a read even so and let me know what you make of the children’s book key that unlocks this mystery and how it compares to Beedle‘s role inside Deathly Hallows. One [of her friends from school] recalls, ‘Jo would entertain us with her brilliant wit and colorful stories. She was very inventive and clever at reading tarot cards and palms and weaving a story around it which was pure make believe but had us alternately gripped and then laughing’ (Sean Smith, J. K. Rowling: A Biography, p 62). Just think what Richard Abanes and Michael O’Brien, leaders of the ‘Harry is the Gateway to the Occult’ brigade in the fin de siecle years of this century, would have made of that. I shudder to think. What it made me realize, though, is that Rowling’s simultaneously hilarious and pathetic Professor of Divinations may be her embedded character, a snapshot of herself placed inside the story as a bit of comic metafiction. I think the character Rowling played in her Comprehensive School cafeteria, the gypsy figure doing funny readings of tarot cards and palms that had her friends “alternately gripped and then laughing,” i.e., readings that were close enough to the truth to fascinate but done in camp, mock New Age fashion to make fun of those credulous enough to believe in such things. 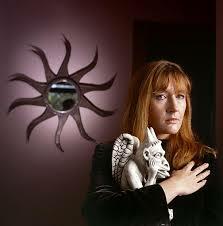 And we know Rowling is not afraid to put images of her self into her books. Not only is Lula Landry’s rags-to-riches and struggles with celebrity in Cuckoo’s Calling a shadow-play of Rowling’s experience but Kathryn Kent, the wannabe writer in The Silkworm, seems a there-but-for-the-sake-of-chance-discovery-went-I character. And most of the characters in Casual Vacancy seem to have been drawn to varying degrees from Rowling’s personal experience. It is the tradition to have four houses, but in this case, I wanted them to correspond roughly to the four elements. So Gryffindor is fire, Ravenclaw is air, Hufflepuff is earth, and Slytherin is water, hence the fact that their common room is under the lake. So again, it was this idea of harmony and balance, that you had four necessary components and by integrating them you would make a very strong place. But they remain fragmented, as we know. There’s no arguing with her about the Houses correspondence; not only is it her world to create on her terms, but the associations make an almost visible sense. Gryffindor as fire evokes the idea of a consuming courage, a burning soul if you will, Ravenclaw as air suggests heights of intellectual abstraction from earthly concern, humble Hufflepuff being earth is a natural because humility is derived from the Latin word for ‘ground,’ and slippery Slytherin with its underground drives and ambitions is a match with water. I think you can see a similar connerction between the characters of Rowling’s Houses and the card suits she has matched them up with. Gryffindor as hearts makes sense because the courageous are known as the Lion hearted. Slytherin as diamonds is a match, too, becauseof the value this House’s natives place on purity (think crystalline structure), appearance, and money and power. Ravenclaw as spades is a bit of a stretch because a spade is an instrument for digging in the ground, pretty much the opposite of ‘air,’ but if you think of serious thinkers as those ‘digging’ for answers, it lines up. That the humble Hufflepuffs are left with clubs, instruments from trees grown in the earth? It’ll do. But there’s a problem, one I suspect Rowling knows but chose to disregard — which problem I discuss after the jump.